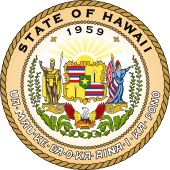 The Hawaii House of Representatives is the lower house of the Hawaii State Legislature. Pursuant to Article III, Section 3 of the Constitution of Hawaii, amended during the 1978 constitutional convention, the House of Representatives consists of 51 members representing an equal number of districts across the islands. It is led by the Speaker of the House elected from the membership of the House, with majority and minority leaders elected from their party's respective caucuses. The current Speaker of the House is Scott Saiki. Legislators are elected to two-year terms and are not subject to term limits. 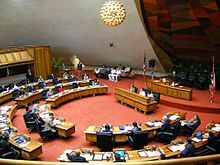 As in many state legislatures in the United States, the Hawaii House of Representatives is a part-time body and legislators often have active careers outside government. The upper chamber of the legislature is the Hawaii State Senate. ^ Eagle, Nathan (December 29, 2014). "State Rep. Johanson Leaves Republican Party, Joins Democrats". Honolulu Civil Beat. Peer News. Retrieved December 29, 2014.